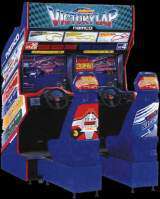 Ace Driver: Victory Lap is a racing arcade game that was released by Namco in 1995; it runs on the company's System 22 hardware, and as the name suggests, it is the sequel to Ace Driver, which was released in the previous year. As in the original up to eight people can play simultaneously when four two-player cabinets are linked together - and all eight cars have been redesigned so that they feature advertisements for Namco games released after the original "Ace Driver", such as Cyber Commando (1994) and Rave Racer (also 1995). Two new tracks have also been added (the Stream Field Circuit, whose name was mentioned on a bridge, from the original title also reappears), and the players must race through all three courses, to compete for championship points; the champion shall be the player who has the most points after the end of the third race (even if he or she did not finish that race first). This page was last edited on 25 January 2016, at 17:17.